Long-time anti-hunger and community food security activist Mark Winne has a new essay on the Supplemental Nutrition Assistance Program (SNAP). Winne is passionate about protecting the program from the deep cuts proposed in the House of Representatives and eloquent about the hardship SNAP participants face in these hard economic times. Imagine a corporation or major private institution that did not conduct research and development, kept the same product line for generations, and never engaged in strategic thinking. That enterprise would be out of business (or subsidized by the federal government). Like Winne, I think it would be fine for USDA to use its existing authority to permit pilot innovations that would change the definition of "food" under SNAP to exclude sugar sweetened beverages such as soda. The New York City proposal was designed to appeal only to public health nutrition advocates and did not do well at building bridges with anti-hunger advocates. Yet, I think both public interest traditions should support such a pilot. The anti-hunger advocates say the proposal is stigmatizing, but I see no evidence that SNAP participants actually would mind. Remember, low-income parents, just like all parents, work hard to choose healthy foods in a rough marketing environment, and they may find the restriction helpful as they discuss food and beverage choices with their children in the aisle of the grocery store. Congress has to draw the line between "food" and "non-food" somewhere, and it makes sense for USDA to use pilot studies to help Congress figure out the best way to do so. If the pilot finds that the proposed reform increases stigma, reduces program participation, or damages food security, the proposal should be dropped. But, quite possibly, the opposite will happen. Anti-hunger advocates may be stuck in the way things have always been, overlooking an opportunity that could be appealing to program participants and politically popular with the public at large. 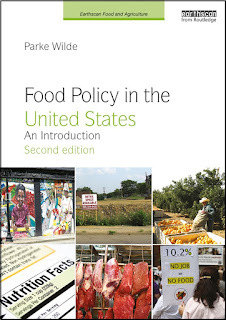 I once interviewed Winne for this blog, shortly after he wrote his book, Closing the Food Gap. Winne's new book is Food Rebels, Guerrilla Gardeners, and Smart Cookin’ Mamas. Education – rather than regulation – is a more productive path to encouraging SNAP participants to adopt healthier habits. The USDA emphasized this point when it said of SNAP: “’incentives – rather than restrictions – that encourage purchases of certain foods or expanded nutrition education to enable participants to make healthy choices are more practical options and likely to be more effective in achieving the dietary improvements that promote good health.” We agree. Restricting what certain Americans can eat will not improve health and reduce obesity. Only education about diet and exercise can do that. I am thoroughly tired of self-appointed thought leaders like Mr. Winne likening anti-hunger advocates to tea party radicals and corporate shills just because they disagree with him on a point of policy. SNAP assists 47 million struggling Americans every day, and does so in a current political climate that is poisonous to its very existence. Debates about this program are therefore too serious to be reduced to name-calling and reputation-slandering. Advocates of the nutritionism reforms Mr. Winne champions (such as banning soda) are sore because they are largely losing -- not just because of corporate lobbying or status quo sentiment, but because of the quality of their ideas. Mark makes an excellent point that the American economy has changed enormously in the past 50 years. Perhaps the loss of a multitude of genuine grocery stores in urban and rural communities throughout the country has been most deleterious to SNAP participants. What about combining significantly increased standards for SNAP retailers with either incentives or some limited restrictions? That seems to me to be the only way to ensure healthier access to food in communities.